LONDON (Reuters) - The United Kingdom's exit from the European Union is uncertain nearly three years after the 2016 Brexit vote. May's divorce treaty, the product of more than two years of negotiations with the EU, was defeated by 149 votes on March 12 and by 230 votes on Jan. 15. Unless May can find a way around Speaker John Bercow's ruling - such as adding an addendum or starting a new session of parliament - she will have to ask the EU to delay Brexit to avoid a no-deal exit on March 29. She had warned lawmakers that unless they approved her divorce deal, Britain's exit could face a long delay which many Brexiteers fear would mean Britain may never leave. The EU has repeatedly said the Withdrawal Agreement is the only deal on the table and May's spokesman said Britain would not be seeking to renegotiate the most contentious part - the Irish border plan. "I think MPs (lawmakers) will see sense and approve the Meaningful Vote before March 29," said Matthew Elliott, the head of the 2016 campaign for leaving the European Union, told Reuters after Bercow's ruling. "The most likely outcome at this juncture is the deal going through," Elliott said. "When it becomes apparent that the only extension on offer from the EU is long, tortuous and with lots of conditions, I suspect enough MPs will get behind the deal for it to pass." If May's deal fails, or if another vote on the same deal is prevented, another option is that parliament at some point takes control of Brexit and lawmakers seek a closer relationship with the EU, staying in the EU customs union. Lawmakers could seek indicative votes on a way forward and there might be a majority for a softer Brexit than May's deal. To avoid that, May could call a snap election, though her party does not want one. Another option, being pushed by some lawmakers is a referendum on May's Brexit deal, though such a vote, were it ever called, would effectively become a referendum on EU membership. 2) BREXIT REFERENDUM - May's deal fails and a long delay allows the campaign for another referendum to gain momentum. An often chaotic set of votes in parliament last week has shown that none of the alternatives to May's deal - such as leaving with no deal, a referendum or allowing parliament to decide how to leave - can muster a majority among lawmakers yet. When asked if he would vote to remain in the EU in a possible future referendum, Corbyn said on Sunday: "It depends what the choice is in front of us." A new party backed by Nigel Farage, the insurgent who helped shove Britain towards the EU exit, has a message for the country's leaders: The foundations of the political system will explode if Brexit is betrayed. 3) NO-DEAL EXIT - The chaos in London is such that parliament cannot find a way to approve May's deal or find another divorce deal option, and after one or more delays, the EU says it will extend no longer. The United Kingdom then leaves without a deal. 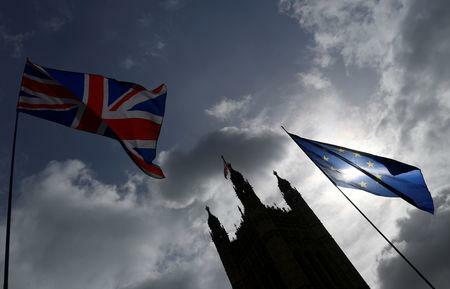 Lawmakers on Wednesday voted 321 to 278 in favor of a motion that ruled out a potentially disorderly "no-deal" Brexit under any circumstances. "You either have a deal, you have no deal, or you have no Brexit," said Brexit Secretary Steve Barclay. And the European Union's 27 other members must unanimously approve a delay to Brexit.